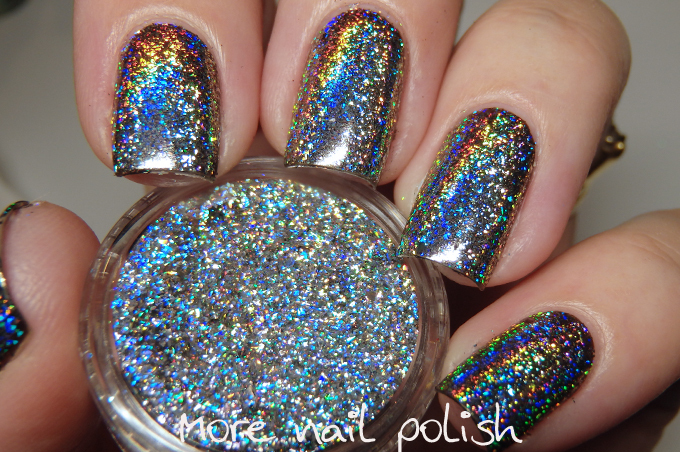 A couple of weeks ago I saw the amazing videos and photos on the Ocean Nail Supply's instagram page of their new scattered holo powder called Galaxy holo. I jumped over to their site to buy a small jar and balked at the $40USD price tag for a 1.8g jar. They also had a 1g jar for $25USD. I was going to bite the bullet and buy it, but upon checkout I discovered I was going to be charged $40USD for shipping to Australia. For 1g! Are you kidding me! So needless to say I didn't buy any and figured I would wait until other suppliers got their hands on it. 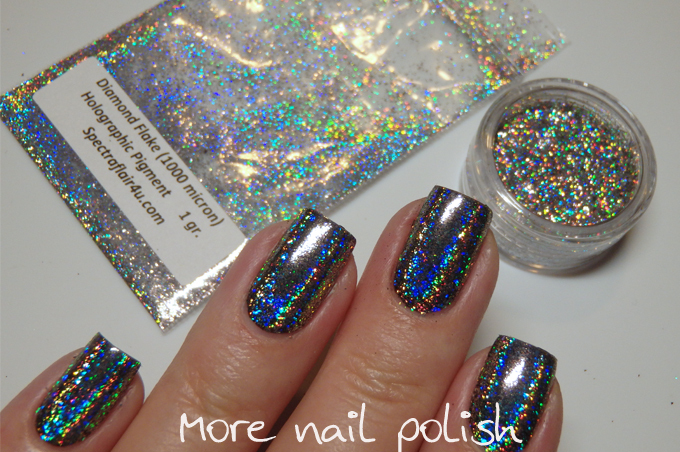 A week later, I was catching up with nail polish creator extraordinaire, Hayley of Emily de Molly fame, and she mentioned that Spectraflair4U had recently stocked a new loose form of the scattered holo flakes (which had previously only been available mixed into polish base). Without question I immediately ordered some for us both. Not only was it $6USD a gram, but shipping was reasonable and it got here in only a week! Great service there! Here is a link to the product on Spectraflair4U. As soon as it arrived, I had to play. It comes in a small ziplock plastic baggie, but I decided to transfer mine into a small clear 1g jar for ease of use in the future. I'm pleased to say that it is a generous 1g in the bag, as my jar was full and there was still some left in the bag. I just applied this like all the other chrome powders, which is giving it a gentle rub into the base polish. 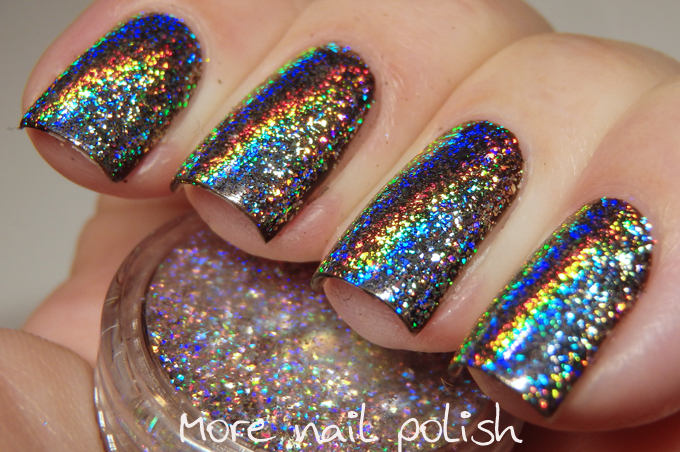 Like usual, I used Dance Legend Glitter Base in black as my base because it dries to a rubbery like finish. I topped it with a water based top coat, specifically the one from the Born Pretty store that came with the mirror chrome polish. 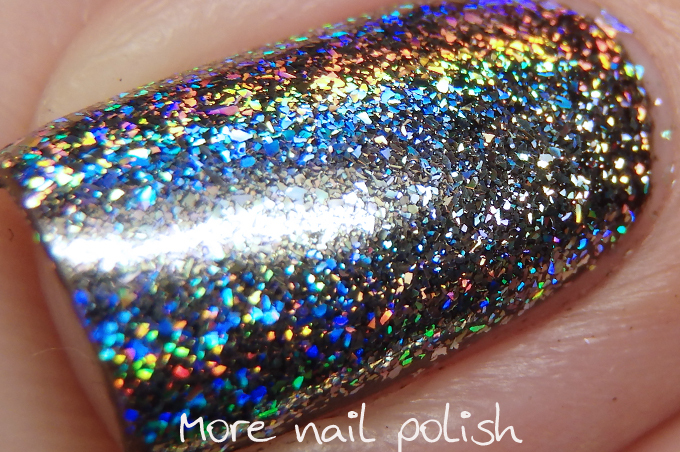 This is so amazing, the flame is so intense and the finish so chunky and sparkly, yet it is totally smooth on the nail. I love it so much. I'm going to be trying it over different coloured bases mext, then I'm going to be using it in jelly sandwiches, and then I might just rub it all over my body! 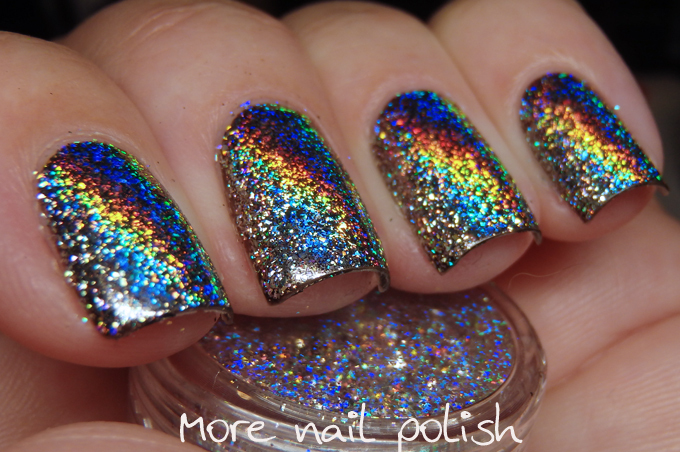 Just a note on this, like the multichrome flakies, these are super light and will blow everywhere with just the slightest breeze. It's also really messy during the application, even though I used a latex barrier. Good news is that clean up is a cinch, After applying the top coat and letting it dry, I just washed my hand under soapy water and all the flakies over my fingers and hands were gone. Go and rub all the things into your nails! Gorgeous! And what a bargain compared to the first one you looked at! Oh god I thought I was just gonna not order more powdery stuff. And now comes this new wave of powders and flakes! Gah!! Oh my goodness... I need to get my hands on these flakes!